BP-85xxe : 12 volt 950mAh ENELOOP NiMH battery for ICOM 2SAT, 2SRA, 24AT, W2A, etc. Home > Aviation Batteries > BP-85xxe : 12 volt 950mAh ENELOOP NiMH battery for ICOM 2SAT, 2SRA, 24AT, W2A, etc. 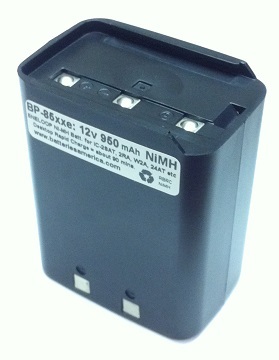 BP-85xxe : 12 volt 950mAh ENELOOP rechargeable NiMH battery for ICOM 2SAT, 24AT, W2A, etc. Replaces original ICOM BP-85. This battery arrives to you PRE-CHARGED & READY TO USE ! These exclusive battery packs are MADE IN THE USA by BATTERIES AMERICA, using premium-quality eneloop NiMH battery cells. These batteries RETAIN THEIR CHARGE WHEN NOT IN USE. They can be re-charged in the ICOM BC-72, or with our EMS-79A.